Product #17042 | SKU BPFL75 | 0.0 (no ratings yet) Thanks for your rating! 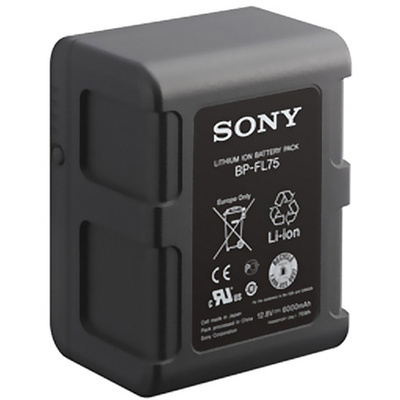 The BP-FL75 12.8V Olivine Lithium-Ion V-Mount Battery from Sony is constructed with olivine lithium-ion phosphate, offering a longer life and quicker charging times (with BC-L90 or BC-L70A chargers) when compared to conventional lithium-ion batteries. This 76 Wh battery supports up to a 10A draw and has built-in sensors to protect it from voltage and temperature fluctuations. A 4-LED push-button gauge displays the remaining battery-power.